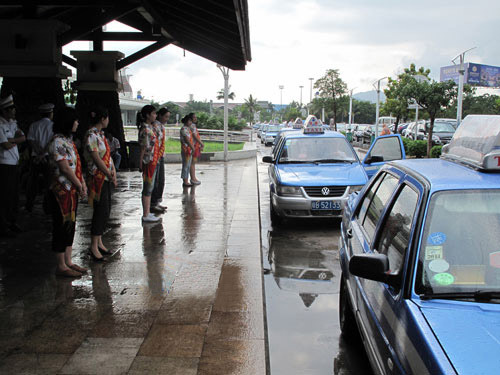 Recently, Sanya Municipal Transportation Bureau released a document which clarifies the prices by taxi from Sanya Phoenix International Airport to hotels and scenic spots in both Chinese and English. According to the document, from the airport to Sheraton Sanya Resort is 100 RMB which is a 31-kilometer trip, to Linda Seaview hotel at Dadonghai square is 68 yuan, to the pedestrian street in Jiefang road is 50 yuan , to No.1 market is 53 yuan , to Haiyue square is 45 yuan, to Howard Johnson Resort Sanya Bay is 30 yuan, to Qingshui bay is 220 yuan and to Haitang bay is 165 yuan. Besides, the official of the Bureau said that the complaint hotline "88667803" is always available if you have any problems regarding transportation during the New Year holiday.